The Peace of Münster was a treaty between the Lords States General of the United Netherlands [a] and the Spanish Crown, the terms of which were agreed on 30 January 1648. 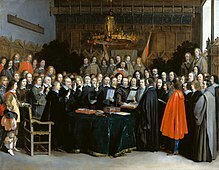 The Treaty is a key event in Dutch history marking formal recognition of the independent Dutch Republic and formed part of the Peace of Westphalia ending the Thirty Years' War and the Eighty Years' War. The Dutch Revolt or the Eighty Years' War of 1568–1648 is the name given to the struggle by the Seven United Provinces of the Netherlands for independence from the Spanish Empire. It began when the Spanish Empire was at the height of its power and initially suppressed but in 1572 the Dutch rebels captured the strategic port of Brielle, providing them with a bridgehead for rapidly expanding the area under their control. Supported by France and Protestant states like England and Scotland, by 1581 the Northern provinces of the Netherlands were de facto independent. By the mid-17th century the Netherlands was the world's leading economic and maritime power, a period of economic, scientific and cultural growth later known as the Dutch Golden Age. Despite these successes, the Dutch failed to expel the Spanish from the wealthy provinces of the Southern Netherlands, modern-day Belgium, Luxembourg plus the Nord-Pas-de-Calais and Longwy regions of northern France. [b] France had financed the Dutch for many years to weaken the Hapsburgs, then the dominant power in Europe;[c] after the Treaty of Prague in 1635 it formally declared war on Spain and the Holy Roman Empire. In 1639, the Dutch navy destroyed a Spanish fleet carrying supplies and men to the Netherlands at the Battle of the Downs while in 1643 the French defeated the Army of Flanders at the Battle of Rocroi. French intervention and internal discontent at the costs of the Dutch war led to a change in Spain's 'Netherlands First' policy and a focus on suppressing the French-backed Catalan Revolt or Reapers War. After Rocroi, France acquired large parts of the Southern Netherlands and Dutch leaders like Andries Bicker and Cornelis de Graeff grew concerned the main beneficiary of continuing the war was France. These fears were heightened by suggestions of a treaty between Spain and France that would be reinforced by a marriage between Louis XIV and a daughter of Philip IV. Such an outcome threatened the Dutch since France would acquire dynastic rights over the Southern Netherlands and potentially the Northern provinces as well. [d] These factors increased the urgency on both sides to end the war. Negotiations between began in 1641 in the towns of Münster and Osnabrück, in present-day Germany. With the initiation of Spanish-Dutch peace talks, Dutch trade with the Levant and the Iberian Peninsula began to flourish. Dutch merchants, benefiting from both the availability of relatively cheap shipping and the cessation of hostilities, soon dominated the markets that had been previously dominated by English traders. Dutch merchants would also benefit from the foreign upheavals of the English Civil War and gain on English trade in their American colonies. While Spain did not recognise the Dutch Republic, it agreed that the Lords States General of the United Netherlands was 'sovereign' and could participate in the peace talks. In January 1646, eight Dutch representatives arrived in Münster to begin negotiations; these included two delegates from Holland with one each from the other six provinces. The Spanish envoys had been given great authority by the Spanish King Philip IV who had been suing for peace for years. On 30 January 1648, the parties reached agreement and the text sent to the Hague and Madrid for approval; it was ratified by the Spanish and Dutch delegations on 15 May, with the States General narrowly approving the Treaty on 5 June 1648. The Peace of Münster together with the Treaty of Münster between the Holy Roman Emperor, France and their allies and the Treaty of Osnabrück involving the Holy Roman Empire, Sweden and their allies were collectively known as the Peace of Westphalia. [e] While European conflict continued, this marks a significant point in the transition to sovereignty based on states rather than individuals e.g. the Hapsburgs. Sovereignty has been defined by historian Harry Hinsley as the idea that there is a final and absolute political authority in the political community...and no final and absolute authority exists elsewhere. Despite achieving independence, there was considerable opposition to the Treaty within the States General since it allowed Spain to retain the Southern Provinces and permitted religious toleration for Catholics. Support from the powerful province of Holland meant it was narrowly approved but these differences resulted in political conflict. An original copy of the treaty is held by the Rijksarchief (Dutch national archives) in The Hague. ^ It also included Upper-Gueldres now split between Germany and the Dutch Province of Limburg. ^ At this time, different branches of the Hapsburg family ruled both the Spanish and Holy Roman Empires. ^ This concern proved justified; in 1660, Louis married Phillip's daughter Maria Theresa as part of the treaty ending the war with Spain and between 1672-1713 fought a series of wars with the Netherlands. ^ The two treaties were ratified on 24 October 1648. ^ Truman, CK. "France and the 30 Years War". History Learning Site. Provides overview of French motives. Retrieved 30 January 2018. ^ Parker, Geoffrey (1972). The Army of Flanders and the Spanish Road 1567-1659: The Logistics of Spanish Victory and Defeat in the Low Countries' Wars (2004 ed.). Cambridge University Press. p. 221. ISBN 9780521543927. ^ Baena, Laura Manzano (2011). Conflicting Words: The Peace Treaty of Munster (1648) and the Political Culture of the Dutch Republic and the Spanish Monarchy. Leuven University Press. p. 240. ISBN 9058678679. Retrieved 30 January 2018. ^ "The Treaty of Münster, 1648" (PDF). University of Massachusetts. Retrieved 29 January 2018.